This is the Park Avenue trail in Arches National Park near Moab, Utah. 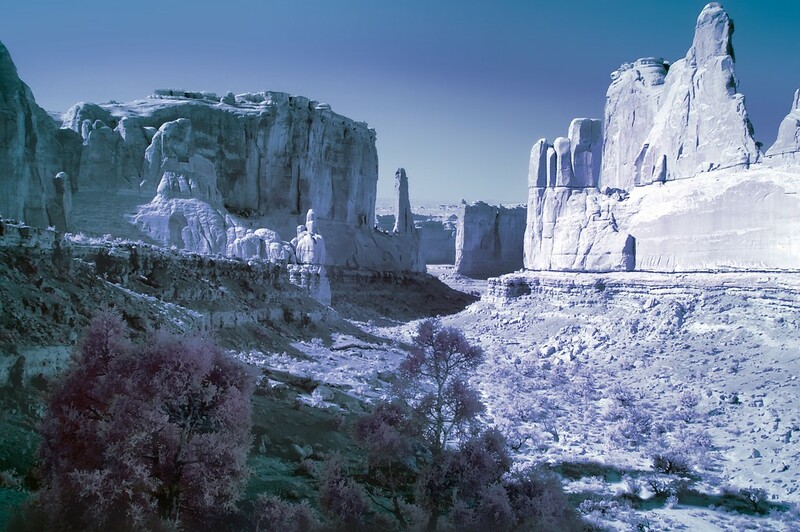 You might recognize it as the opening shot of Indiana Jones and the Last Crusade, although not in infrared, of course. I flipped the red and blue channels in Photoshop, which is probably the second most common infrared processing treatment after black and white. Among my photographic friends, the most prolific and proficient infrared practitioner is Scott Wood. You can see a recent example of his IR landscape work here, and browse through his IR category at this link. Nice image and thanks for the mention in the post, I really do appreciate it. I love what the IR spectrum reveals in photography, this is a truly great example of this Mark! Great shot, my friend!